We invite you to join our web affiliate team! 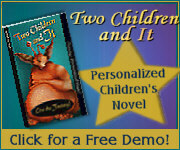 We are seeking Internet affiliates to aggressively market our line of personalized children's novels. The Kids Book By You™ product encourages creativity and educational motivation in a fun and humorous way, and can be positioned for all website formats. Everyone can join the adventure! Sign up now! Or if you're already an affiliate, click to login to your affiliate account! When sales are generated by one of your visitors who've clicked through to our site from the banner, you'll receive a 13% commission! Enhance your site and offer your visitors the opportunity to star in their own personalized novel. For more details on the program, click here. Step 1. Complete the online Affiliate Program Application. We will review your application and notify you of whether you have been accepted as an affiliate. Step 2. Once you have received your acceptance email, login to your affiliate control panel to find instructions for the code, graphics and links to use on your site. Want more information about this program? Visit our Contact page to see how you can get in touch with us!